In this day and age, it’s much easier for independent game developers to create and share their games than it has ever been before. Naturally, this can result in a multitude of sub-par games (one only needs to scour Kickstarter for a little while to see this), but Vertical Drop Heroes HD by Nerdook Productions isn’t one of those games. I was a bit doubtful at first, given the number of procedurally-generated RPGs and rougelikes on platforms like Steam and GOG.com. However, I was surprised at how fun and addicting VDH can be. The game is a “procedural platformer RPG hybrid with roguelike elements, where your hero adventures through randomly generated stages.” The goal of VDH is simply to gather coins, buy power-ups, beef up your heroes, and make it through from start to finish, beating down bosses and minions along the way. There is no grandiose, complex fantasy plot, no epic journey to parts unknown, no princess in another castle. There is simply the joy of beating up baddies, leveling up, and dishing out tons of damage. And, truth be told, that’s what I love about VDH. In Vertical Drop Heroes HD, you start off the game by picking from a small selection of heroes, each with different stats and powers. 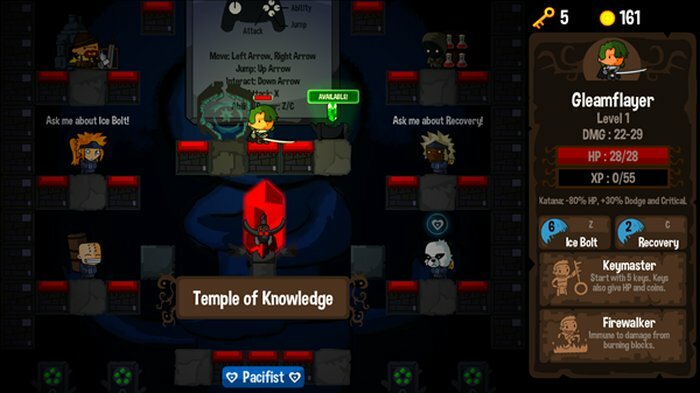 Once you’ve selected your hero, you’ll be introduced to the game’s hub, where you can buy weapon upgrades, item upgrades, upgrades to your “Pacifist points,” view your unlocked powers, and select “New Game +” mode if you’ve finished the main game. Once you’ve prepared yourself for the fight ahead, you can head through the portal into the main game, or, if you have enough coins, skip a few levels and start from a later level in the game. At the beginning of each level, your hero will be dropped at the top of the stage. From there, you must use your platforming and sword-swinging skills to make your way to the bottom of the level, where you’ll find the level boss and portal to the next level waiting for you. How you make your way to the end of the level, however, is entirely up to you. Levels are randomly generated, with platforms, minions, coins, keys, items, boxes, and chests. You can use coins that you find for power-ups throughout the game, including permanent powers that you can purchase from merchants scattered throughout the levels and shrines that will give your heroes temporary stat boosts and powers for the remainder of the level. 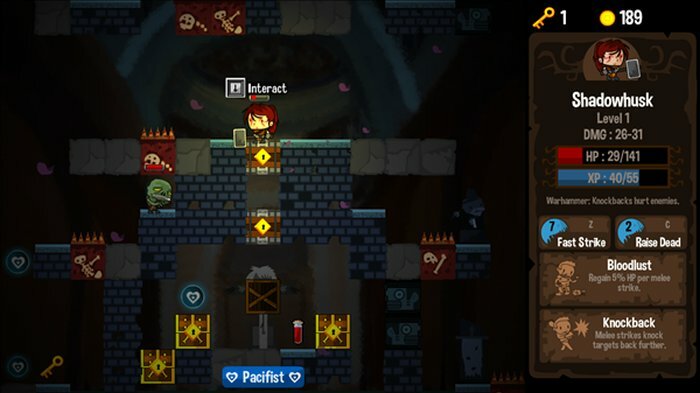 You’ll be able to use the keys you find to unlock chests and gates to obtain more treasure, unlock cages containing allies who will help you progress, or to bypass the level boss entirely and open the gate to the next level. You might also come across characters that will request that you kill certain enemies or collect certain items, in return for gold or stat increases. Of course, being a rougelike game, your hero will probably die at the beginning of the game, and you’ll have to select a new hero to use. Luckily, your coins and power-up purchases will carry over to your new heroes, making progression very rewarding as bosses and minions become easier to overcome. Of course, if fighting is not your thing, the game also presents hero progression through “Pacifist points,” orbs that you can collect as you fall through the stage, avoiding enemies as you go. Trying to complete levels without fighting minions and bosses presents a new challenge to the game, as fighting enemies can sometimes become unavoidable. Thankfully, there are powers, allies, and even enemies that can blast through platforms, opening up new paths for you to fall through as you journey downward. 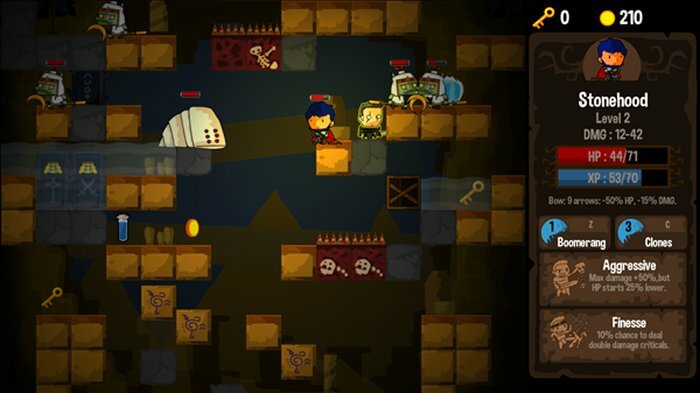 With all of these options for progression, stat upgrades, and various unlockable powers, Vertical Drop Heroes HD is a delightful, addicting game with high replayability. With all this, plus a split-screen mode for two players and online multiplayer, you have a generous amount of content in a deceptively small package. For its $5.00 price-point, VDH is a great value, and is a nice way to unwind. If you want a break from your typical shooters or stealth-action games, this game is a great alternative. Just sit back, relax, and slash your way through hordes of minions and bosses.